Being a part of the MQG community is a great way to connect with others and find new opportunities if you just have the courage to raise your hand. Last year, they put out a call in their members-only newsletter asking for Pattern Designers. I thought about it for a while, honestly a little intimidated; but my fears quickly fizzled when I sent an email inquiry to Jen, who is the Communications Manager for the MQG, and was also moderating the program. If you don't know Jen, you really should...she's awesome! 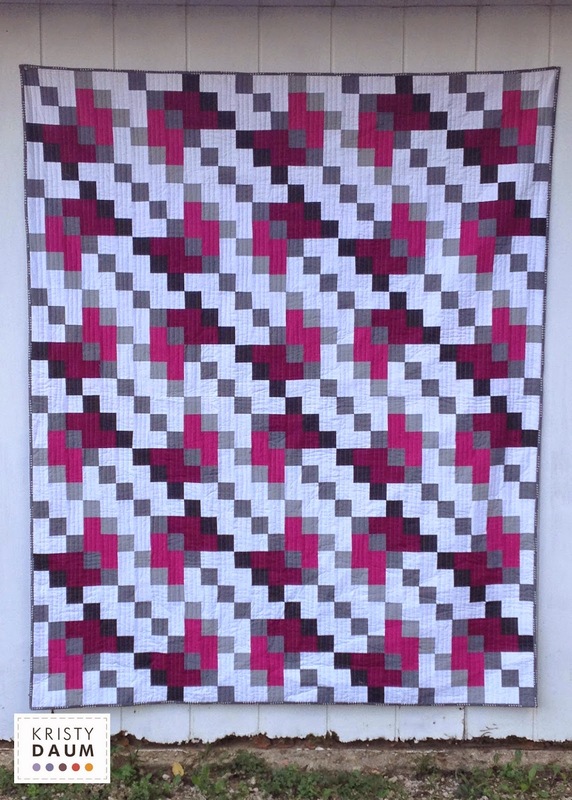 It is now nearly a year later and I can finally share with you the quilt that I made...titled SHIFTED. 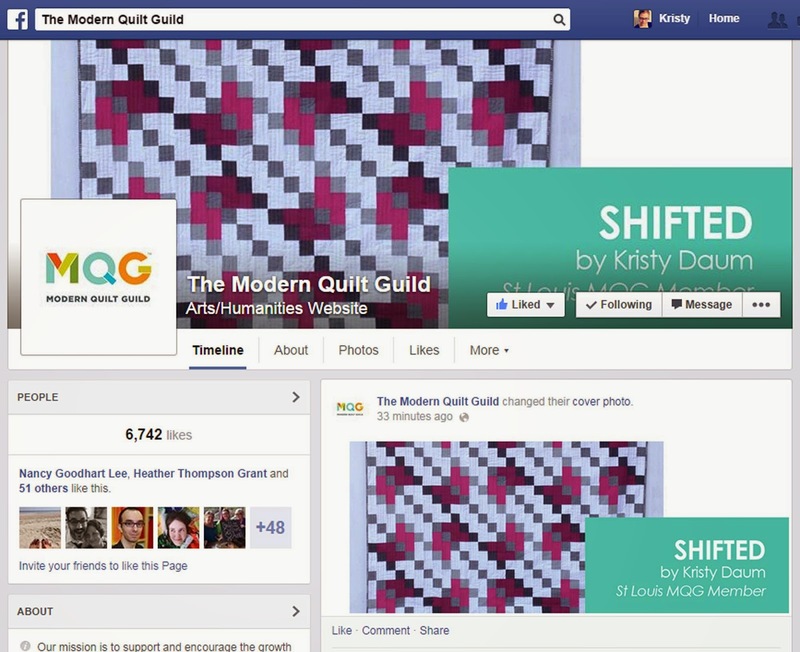 For those of you who are official MQG members, there should be a newsletter sitting in your inbox with information on how to download the free pattern. For those of you who are not MQG members, you'll just have to wait. 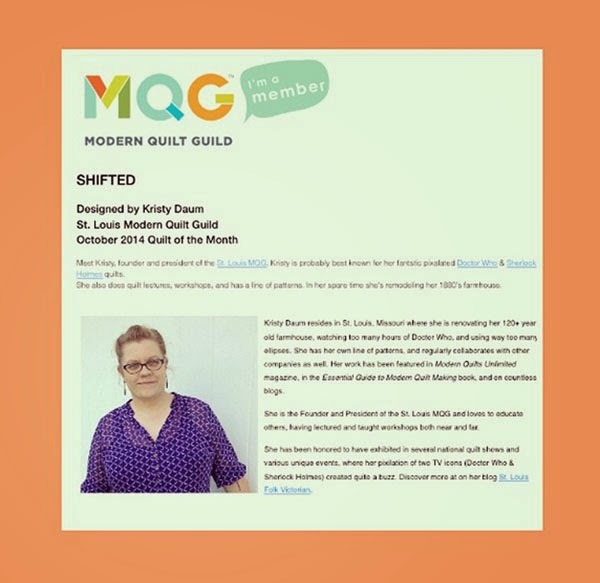 SHIFTED will be hanging in a special exhibit at the QuiltCon 2015 quilt show that features all of the other quilts that have been free MQG newsletter downloads this year, so it will be among lots of great company. Be sure to use #mqgshifted and @LoveOldHouses when tagging this pattern on social media, and if you want to see the whole newsletter series, search #mqgquiltofthemonth . So, tell me...what color palette would you make SHIFTED in? I got the email this morning and gave a little squee on your behalf! Congratulations - it's beautiful! I love it! Beautiful color palette, great design. Congrats! Great use of Radiant Orchid. What other color palettes do you see it in? Beauty! I love this layout, any colorway would look great. Cogratulations!